Last weekend I was out testing the new #GoProHero7 with @kaikourakayaks and my mate @taiyomasuda. After a fun paddle around the peninsula catching waves we spotted a giant male seal fighting an octopus. Before we knew it the fight came to us and well the rest is slap to the face. 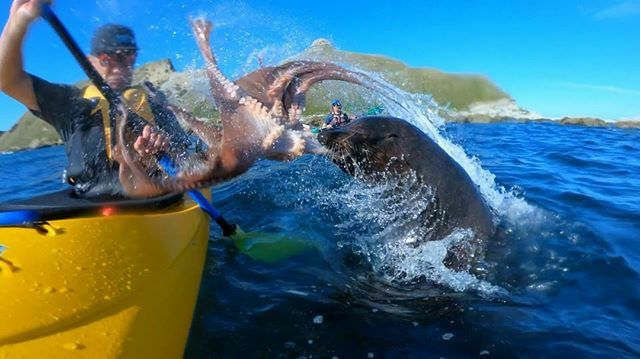 I’m not sure who got more of a surprise the seal, the octopus or me. Either way the octopus held onto the bottom of kayak for some time before our guide was able to get it off with his paddle then it swam away to fight another day. True story.